SUBHEAD: You’ll have to earn everything worth having, including self-respect and your next meal. 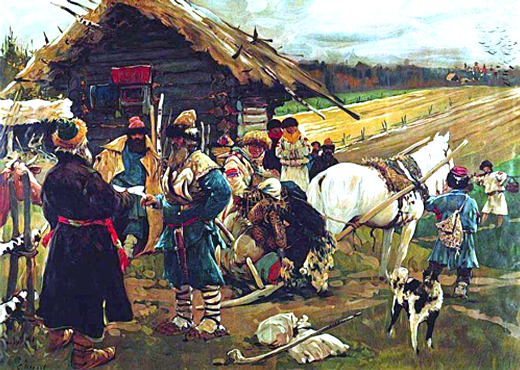 Image above: Aarly 20th century Russian painting of "A Peasant Leaving His Landlord on Yuri's Day" by Sergei V. Ivanov. From (https://www.kp.ru/radio/26511/3430500/). The trouble, of course, is that even after the Deep State (a.k.a. “The Swamp”) succeeds in quicksanding President Trump, America will be left with itself — adrift among the cypress stumps, drained of purpose, spirit, hope, credibility, and, worst of all, a collective grasp on reality, lost in the fog of collapse. Here’s what you need to know about what’s going on and where we’re headed. The United States is comprehensively bankrupt. The government is broke and the citizenry is trapped under inescapable debt burdens. We are never again going to generate the kinds and volumes of “growth” associated with techno-industrial expansion. That growth came out of energy flows, mainly fossil fuels, that paid for themselves and furnished a surplus for doing other useful things. It’s over. Shale oil, for instance, doesn’t pay for itself and the companies engaged in it will eventually run out of accounting hocus-pocus for pretending that it does, and they will go out of business. The self-evident absence of growth means the end of borrowing money at all levels. When you can’t pay back old loans, it’s unlikely that you will be able to arrange new loans. The nation could pretend to be able to borrow more, since it can supposedly “create” money (loan it into existence, print it, add keystrokes to computer records), but eventually those tricks fail, too. Either the “non-performing” loans (loans not being paid off) cause money to disappear, or the authorities “create” so much new money from thin air (money not associated with real things of value like land, food, manufactured goods) that the “money” loses its mojo as a medium of exchange (for real things), as a store of value (over time), and as a reliable index of pricing — which is to say all the functions of money. In other words, there are two ways of going broke in this situation: money can become scarce as it disappears so that few people have any; or everybody can have plenty of money that has no value and no credibility. I mention these monetary matters because the system of finance is the unifying link between all the systems we depend on for modern life, and none of them can run without it. So that’s where the real trouble is apt to start. That’s why I write about markets and banks on this blog. The authorities in this nation, including government, business, and academia, routinely lie about our national financial operations for a couple of reasons. One is that they know the situation is hopeless but the consequences are so awful to contemplate that resorting to accounting fraud and pretense is preferable to facing reality. Secondarily, they do it to protect their jobs and reputations — which they will lose anyway as collapse proceeds and their record of feckless dishonesty reveals itself naturally. The underlying issue is the scale of human activity in our time. It has exceeded its limits and we have to tune back a lot of what we do. Anything organized at the giant scale is headed for failure, so it comes down to a choice between outright collapse or severe re-scaling, which you might think of as managed contraction. That goes for government programs, military adventures, corporate enterprise, education, transportation, health care, agriculture, urban design, basically everything. There is an unfortunate human inclination to not reform, revise, or re-scale familiar activities. We’ll use every kind of duct tape and baling wire we can find to keep the current systems operating, and we have, but we’re close to the point where that sort of cob-job maintenance won’t work anymore, especially where money is concerned. Why this is so has been attributed to intrinsic human brain programming that supposedly evolved optimally for short-term planning. But obviously many people and institutions dedicate themselves to long-term thinking. So there must be a big emotional over-ride represented by the fear of letting go of what used to work that tends to disable long-term thinking. It’s hard to accept that our set-up is about to stop working — especially something as marvelous as techno-industrial society. But that’s exactly what’s happening. If you want a chance at keeping on keeping on, you’ll have to get with reality’s program. Start by choosing a place to live that has some prospect of remaining civilized. This probably doesn’t include our big cities. But there are plenty of small cities and small towns out in America that are scaled for the resource realities of the future, waiting to be reinhabited and reactivated. A lot of these lie along the country’s inland waterways — the Ohio, Mississippi, Missouri river system, the Great Lakes, the Hudson and St. Lawrence corridors — and they also exist in regions of the country were food can be grown. You’ll have to shift your energies into a trade or vocation that makes you useful to other people. This probably precludes jobs like developing phone apps, day-trading, and teaching gender studies. Think: carpentry, blacksmithing, basic medicine, mule-breeding, simplified small retail, and especially farming, along with the value-added activities entailed in farm production. The entire digital economy is going to fade away like a drug-induced hallucination, so beware the current narcissistic blandishments of computer technology. Keep in mind that being in this world actually entitles you to nothing. One way or another, you’ll have to earn everything worth having, including self-respect and your next meal. Now, just wait a little while.